Dhokla is a baked dish from Gujrat. It looks soft as sponge and tastes delicious. Usually it is taken as snack and is served along with green chutney also called as coriander chutney or mint chutney. It is baked after fermentation and this initial preparation needs to be done carefully. 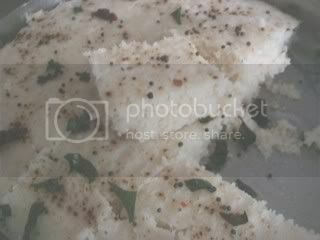 There are different versions of dhokla, I am here giving the original and age old method of preparing dhokla. People often get confussed between Dhokla and Khaman Dhokla. Khaman dhokla is yellow in colour and is prepared from besan while Dhoka is white in colour and is prepared by grinding together rice and lentsil. 2 green chillies chopped or red chillies. Mix the rice and dal, wash, drain and dry on a clean cloth for a few hours. The grain should be completely. Grind to a coarse flour in dry grinder or at the flour mill. This flour should be like very fine soji in texture. Store in airtight container and use as required. Will keep good upto 2 months. To make , take 1 cup flour in a bowl. Add buttermilk, and mix well. Keep- aside for 4-5 hours. Dissolve sodabicarb in the oil. Add to batter. Mix all ingredients except red chilli powder and coriander. Pour immediately in a 6" diam. greased plate. Steam over water either in a cooker or steamer for some 15-16 minutes. Pierce knife, and check, should come out clean if done. Sprinkle the chilli powder and coriander, steam again for 2-3 minutes. Heat the oil for seasoning in a pan. Toss in the mustard seeds and fry till they splutter. Add green chillies and allow to spluter. Add Asafoetida to it. Add the sesame seeds and fry briefly till they are light brown and aromatic. Pour this over the steamed dhoklas. Ganish with lots of coriander and grated dry coconut. Cut into pieces and serve hot with any tangy chutney or just tomato sauce. Shelflife: 1 day( best fresh). Note: While stirring the batter, do take care to stir along one direction only. By stirring the batter in one direction , the dhokla batter fermentes nicely and the final result is spongy and delicious. Click here to know more about Gujrati foods and cuisines- An Introduction To gujrati cuisines and Recipes.